What makes a true variety show? An exciting mix of instrumental favourites – pop, country, jazz and old-time rock ‘n’ roll? Add to that some sparkling guitar, nostalgic harmonica and a dash of humour – all designed to appeal to a wide age group. BOB HOWE does it all, paying tribute to the legends; from Beethoven to The Beatles to Benny Hill. His show also includes revivals of ‘classic’ hits and features magnificent movie and television themes from his instrumental CDs. 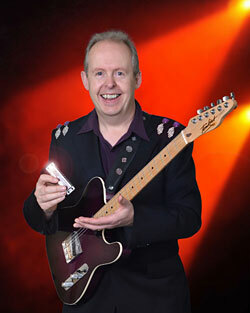 Armed with an electric guitar, a harmonica, a quick wit and a close rapport with the band, BOB HOWE has delighted audiences around the globe. He carefully selects his repertoire from timeless classics and hits that transcend all boundaries. Having grown up listening to everything from Beethoven to The Beatles, Bob has never found any difficulty in moving from one genre to another and taking the audience with him on a magical, musical tour. His instrumental tribute to the comedian beloved by all nations, Benny Hill, is always a high point of his show. The energy and dexterity of Bob’s uptempo numbers are perfectly balanced with the expressive technique he displays during the melodic guitar ballads. His stature as a performer has won him many awards including the prestigious Australian Entertainment ‘MO’ Award…THREE times! Bob’s long and varied career has made him highly in-demand as a multi-instrumental musician. He has played everywhere from The Sydney Opera House to the Melbourne Myer Music Bowl, from The Palomino Club (Los Angeles) to The Sheraton (Nashville), and from Caesar’s Palace (U.K.) to the Tanglin Club (Singapore) and headlined his own show on International cruise ships! On the musical theatre stage he has portrayed some of his heroes including Paul McCartney in ‘Lennon – The Musical of the Legend’ and guitarist James Burton in ‘ELVIS – The Stage Musical’. As a musical director he has conducted for international singers such as Frank Ifield and Guy Mitchell and he has toured as guitarist for Diana Trask and Val Doonican. In Australia he is also known to thousands of ABC Radio listeners as ‘Big Bob from Bondi’. Throughout his career he has met many musical legends including Tina Turner, Shirley Bassey, Peter Allen, Brenda Lee and Roy Orbison – all of whom have inspired him to reach for the heights of dazzling entertainment. See BOB HOWE – “Guitar Man” step into the spotlight NOW!